Rita Blitt, a Kansas City-based, award-winning painter, sculptor and filmmaker, recently donated 27 pieces of art to KCU. The works reside in the newly renovated Administration Building, which re-opened in January. Blitt is known for her abstract art, which celebrates her love of nature, music, dance and the spontaneous flow of movement captured in the drawn gesture. These pieces add a positive energy to the new Administration Building space and offer an uplifting aesthetic for all to enjoy. To learn more about Blitt, visit her website. Faculty and staff participated in KCU's fourth annual Score 1 for Health Employee Community Service Day on Jan. 15, assisting with health screenings alongside second-year medical students at five local elementary schools. The screenings included a physical assessment of dental health, vision, height, weight and blood pressure. Score 1 for Health is both a service to the community and a learning tool to enhance educational experiences for KCU medical students. 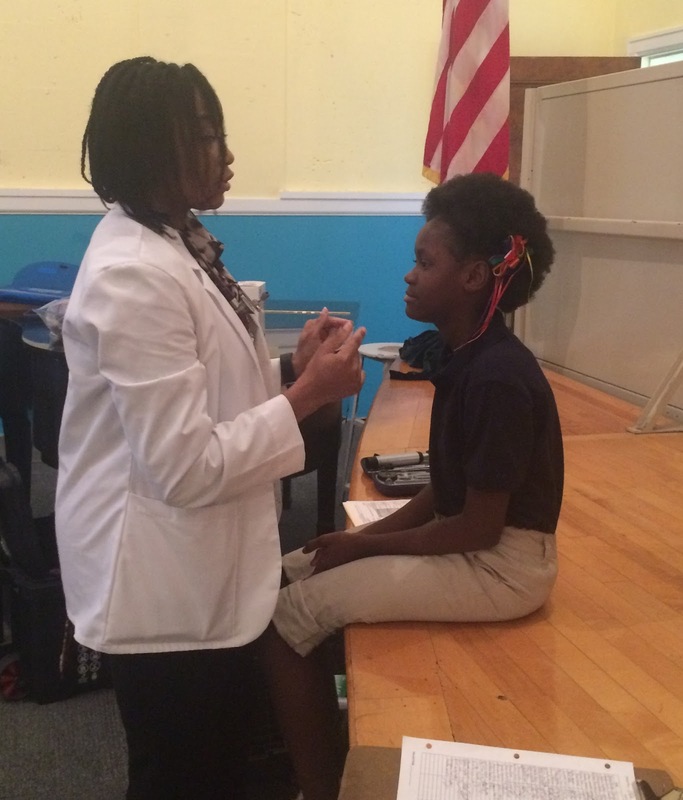 Last year, Score 1 conducted comprehensive health screenings for nearly 15,000 primary and secondary school children at 50 schools and community locations throughout the Kansas City area. Learn more about Score 1 for Health. At our January board meeting, KCU unveiled a new sculpture by world-renowned local metal fabricator, A. Zahner Co. The piece, which was installed in conjunction with improvements to the exterior of the Academic Center, is located on the southwest wall facing the prominent intersection of The Paseo and Independence Avenue. 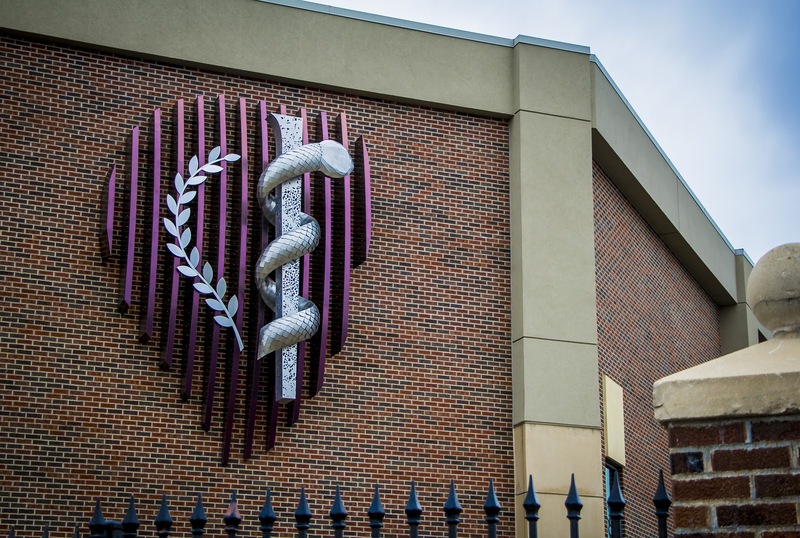 Nearly 17 feet tall and 12 feet wide, the structure creates a unique icon for KCU's campus and reinforces the University's continued commitment as an anchor in Kansas City's Northeast neighborhood. The sculpture is fabricated from stainless steel having a purple light-interference coating and distinctive brushed patterns. 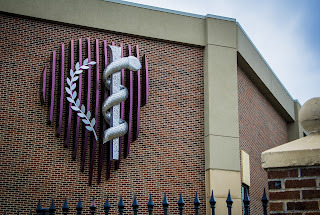 The three-dimensional artwork embodies the University's recent rebranding, which features the staff of Asclepius (the serpent-entwined rod associated with medicine and healing originating in Greek mythology) and laurel leaves (representing education and wisdom in academia). Additionally, fiber-optic lighting was designed and installed to create a distinct color-rendering effect in the evening hours. 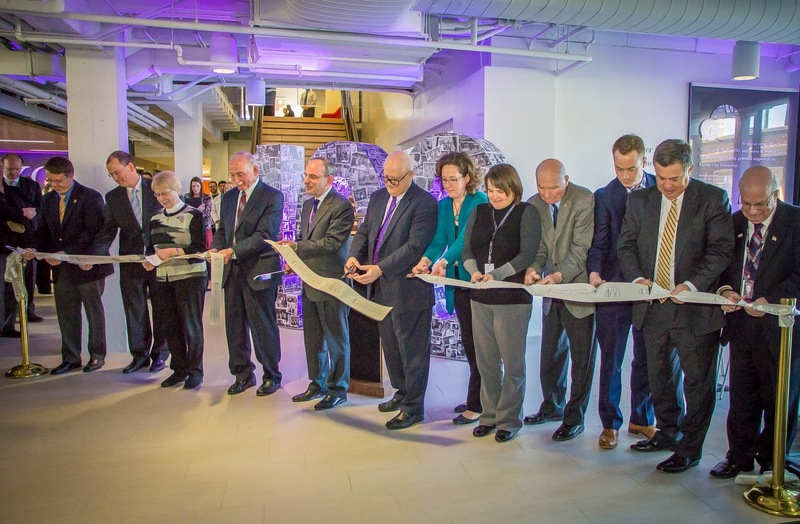 KCU held a ribbon-cutting Jan. 12 to inaugurate its newly renovated Administration Building. The ceremony, which also served as the kickoff event for KCU's 2016 Centennial celebration, was attended by KCU students, faculty, staff and alumni, as well as key civic leaders, elected officials and members of the Kansas City community. Originally home to the first Children's Mercy Hospital, The Administration Building has a rich history with the University. The 100-year-old facility was purchased in 1971 by the KCU Alumni Association and was gifted to KCU in 1975; it became the University's permanent address in 1979. Today, the building houses more than 70 members of KCU faculty and staff. Healthy KC, an initiative that aims to create a culture of health and wellness in Kansas City workplaces, honored KCU, along with other certified companies, at its recognition luncheon on Thursday, Jan. 7. Healthy KC certification is based on four "pillars" of health, including nutrition, physical activity, tobacco cessation and work/life integration. A company's level of certification (gold, silver, bronze or honorable mention) is based on its achievement across those pillars. KCU was awarded certification at the sliver level. In partnership with Blue Cross and Blue Shield of Kansas City and the Greater Kansas City Chamber of Commerce, Healthy KC promotes real solutions that help shape individual, organization and environmental health change. 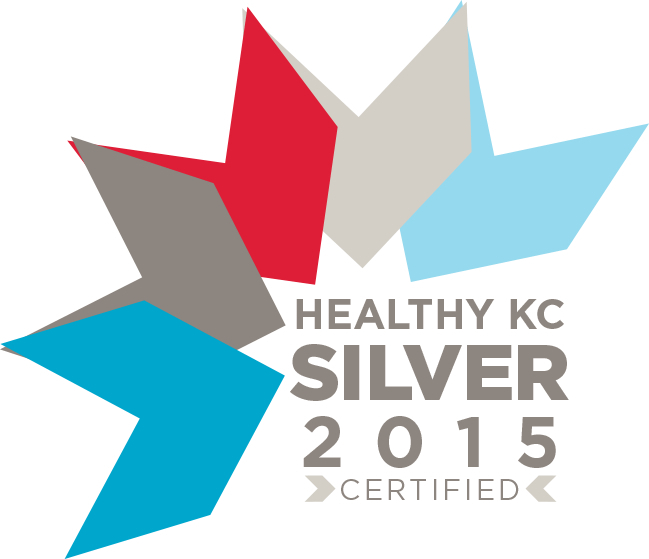 Find out more about Healthy KC.